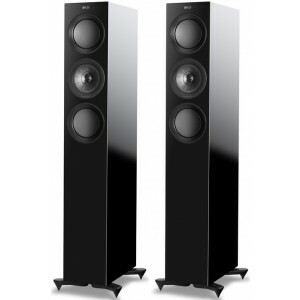 R5 is the entry-level floorstanding speaker in the completely redesigned KEF R range sitting below the larger R7 and R11 models. KEF R5 features svelte styling and contains the same Uni-Q as its bigger brothers, with a 5" midrange driver and 1" aluminium dome tweeter producing incredible levels of detail. 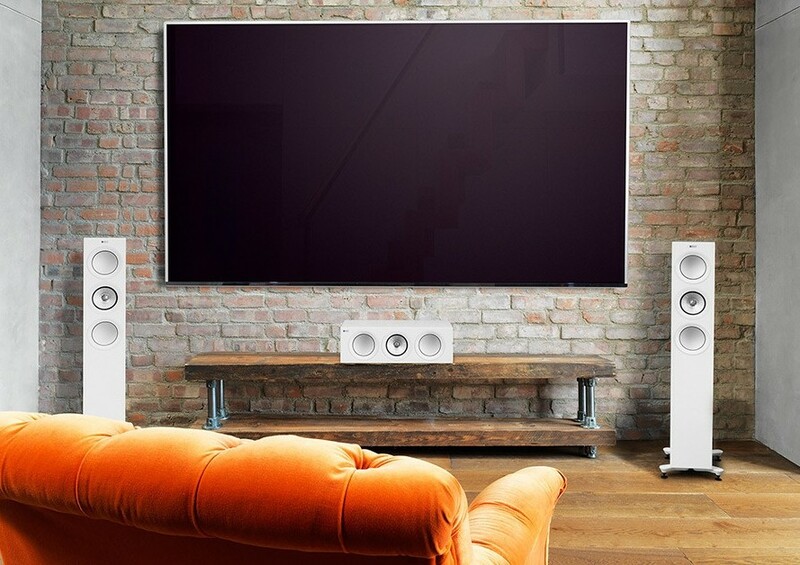 The slightly smaller 5.25" bass drivers still produce exceptionally clean bass, whilst being easily placed in a smaller room, or as surround speakers forming part of an ultimate home theatre system. Derived directly from the Reference Series, the Shadow Flare is an innovative method of reducing harmful cabinet diffraction for delicate high-frequencies. Shadow Flare is a carefully profiled transition surface which extends the waveguide effect of Uni-Q. The tweeter no longer has a line of sight of the cabinet edges, creating a ‘shadow region’ at the points where the potential for diffraction is highest. The result is vastly improved fine detail, particularly when it comes to the subtle nuances of plucked strings and other percussive sounds. Bass is the very foundation of music; everything is built upon it and maximising bass performance is a vital building block towards the pristine sound. R Series bass drivers are built using a two-part structure, where a shallow concave aluminium skin sits atop a paper cone. This great stiffness, combined with the cone’s unique geometry, delivers pure piston-like movement to deliver punch and speed. To accurately control this mighty driver, KEF has also completely redesigned its magnet system to create a more even magnetic field. The overall result is more impressive and impactful. When it comes to generating deep, articulate bass, port design is crucial. The ports in R Series feature innovative flexible walls. Using computational fluid dynamics, the flare and profile of each port are calculated to delay the onset of turbulence, while the flexible port walls prevent longitudinal resonances from colouring the midrange. All crossovers have a reduced component count. 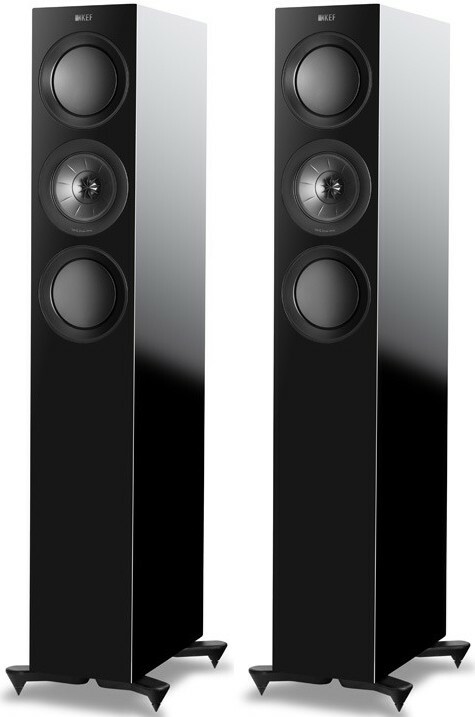 This has been made possible due to the decoupler in the Uni-Q midrange as well as the improved tweeter, both of which have inherently smoother responses and require less correction from the crossover. The series resistors in the MF and HF sections are merely to change the output level of these drivers to match that of the bass drivers. The HF section features a tuned circuit (L1/C2) in parallel with the driver. This tuned to the fundamental resonance frequency of the driver and allows the series capacitor to have the correct attenuation. Without it, there would be an excessive movement of the diaphragm and an unwanted hump in the response. All R Series cabinets are designed to look good. They have clean lines, there is a choice of nishes – black gloss, white gloss, walnut – and the frontal aspect is slim. The quality of fit and finish is high and for those who prefer not to see drivers, there is the option of magnetically attached grilles. The grilles are designed to have minimum effect on sound quality. I have had the R5s now for a week, and still "running them in!" My initial impression was that the treble was a bit reticent, but as they have been used, and listening to more and more of my CDs and LPs etc, (mostly classical) I now find that the treble is very detailed and natural. The midrange and bass the same - the venue of the recording venue is clearly obvious, and a spacious image is formed. The bass is accurate and detailed - NOT boomy and one note thumps - so likely would not be good enough for heavy metal rockers or bass freaks! The speakers will go loud without strain and have good impact. Pedal notes on Church Organs very realistic. On popular music good impact and highly detailed, though revealing of poor and over processed productions. 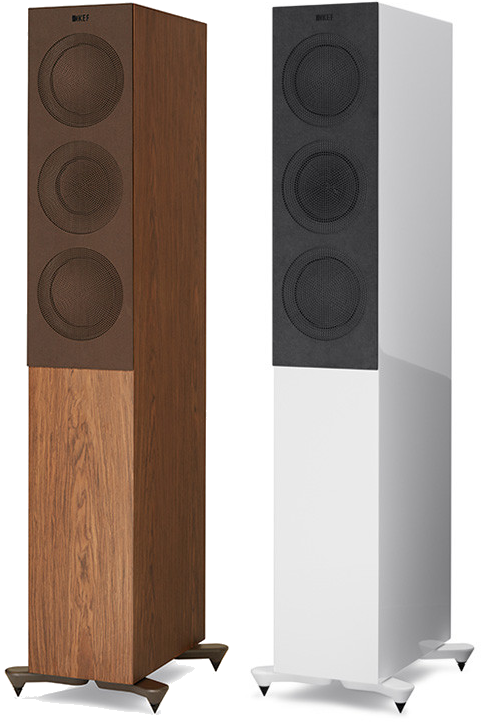 The finish and appearance of the R5 (in walnut) is of a very high standard, and the supplied magnetic grills very pleasing and have no effect on the sound quality. Fitting the feet and spikes (small cups are also provided for the spikes if to be placed on bare floors) takes some time, and with the heavy weight can take some effort to move into place, so preferably two people needed! Very pleased and highly recommended, though as with all speakers, a dealer demonstration is always advisable. Very good service from Audio Affair in Birmingham.